For Dotty Franklin, the Charles isn’t just a river, it’s a fountain of youth. 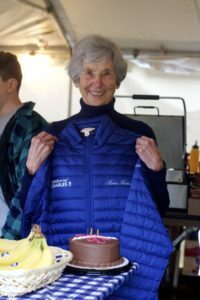 Celebrating her 90th birthday on the regatta grounds this Saturday, Aunty Dotty, as they call her around the food service tent where she is also celebrating her 25th year as a volunteer. Alongside her extended family, Franklin serves up everything from hot chocolate to mac and cheese at the food vending area at the end of the vendor’s row beside the river. Working at her nephew David Poritzky’s food service company, David’s World Famous Inc., she has been a part of the staff since it first came to the HOCR in 1993. Healthy she is, standing behind the register with a smile in a warm blue turtleneck. Interacting with people her whole life has kept her young, she said, and that’s about it, as her niece in-law mentioned she hasn’t eaten a green vegetable in ages. Surrounded by children, nieces, nephews, and cousins, about 20 relations in total, the familial atmosphere mingled with the smell of freshly brewed coffee and soon, a chocolate birthday cake with candles for the 90th birthday girl was brought out. “A second cake!” she exclaimed. Birthday or not, a typical day at the regatta for Franklin starts before the sun comes up. Waking up at 4:30 a.m., the family arrives each morning at 6 a.m. to set up and get started. From Friday through Sunday, this is the annual routine, and she also helps out at other events when she can. So maybe it’s something in the air or a magic aura in the river that keeps Aunty Dotty on top of her game, but she has another hypothesis.